What is good about Kelly's Heroes is its creators are fully aware they are making comedy. They do not pretend that this is a serious film about war or try to convey any message. The movie is intended to entertain and it does in a very vital way. Similar to Where Eagles Dare, which was also directed by Brian G. Hutton and starring Clint Eastwood, Kelly's Heroes does not have the most plausible war story. But since the latter film is a parody anyway, nobody needs complete plausibility. The main purpose of a comedy is to be funny and this movie achieves it effortlessly. Kelly's Heroes begins with Private (Ex-Lieutenant) Kelly (Clint Eastwood) capturing a German Colonel during World War II. Kelly notices a golden bar in the bag of the colonel so he makes him drunk in order to find out the amount and the location of the gold. After discovering that the gold in the colonel's bag is just a small piece of a huge treasure, Kelly plans to assemble a team of soldiers determined to go behind enemy lines and steal the Nazi treasure. A lot of colorful characters plus a few tanks join the team and the squad makes the impossible in order to put their hands on the bullion. The cast of this film is probably its greatest virtue. Clint Eastwood presents his usual restrained and solid acting. He is the leader of the team but there are far more picturesque characters that eclipse his performance. Despite being a private Kelly gets the support of several sergeants and these are arguably the most vivid figures in the film. MSgt. Big Joe (Telly Savalas) is Kelly's direct superior who is initially hesitant about the venture but since everyone else under his command wants to participate in the initiative of making money, Big Joe has no other option unless to agree. Big Joe is almost constantly pissed off even if worried about his boys. Another notable character in Kelly's Heroes is SSgt. Crapgame (Don Rickles). Rickles gives a very good performance of the get-rich-quick enthusiast who can supply anything in the army. He isn't brave but if a deal can be made somewhere Crapgame is the man to spot it. He is the one suggesting to Big Joe in regard with a German tank commander: "Then make a DEAL! A DEAL, deal! Maybe the guy's a Republican. Business is business, right?" The most remarkable character though is Sgt. Oddball (Donald Sutherland) who is completely out of place and time with his hippie attitude. Donald Sutherland is wonderful in this role and contributes a lot to make the movie genuinely funny. "Don't hit me with them negative waves so early in the morning." There are other characters like Major General Colt (Carroll O'Connor), Oddball's technician Moriarty (Gavin MacLeod) and the chief of the artillery 1st Sgt. Mulligan (George Savalas) that also help a lot for the great entertainment Kelly's Heroes offers but in addition to the great cast and characters, we should allude a few more things. The story and the writing are strong. The movie is almost permanently funny without using unnecessary violence or too rough language. The director has done a great job as well. I mentioned about the out-of-time psychedelic attitude of Sergeant Oddball but there are also various references to other genres and films. A Western scene referring to The Good, the Bad and the Ugly is among the highlights. 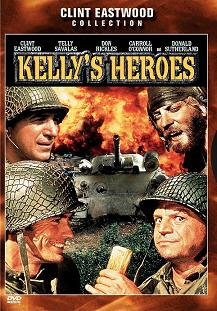 Kelly's Heroes is a good example of a comedy based on a balanced story with solid characters and without many of today's brainless techniques and tricks often used to compensate the lack of enough quality laughter. This movie possesses the power to appeal just because it does what comedies should do. It entertains and it makes you laugh.